It takes about 40 mins to an hour to get takeout delivered. Timely deliver is unheard of down south. Man, I do miss that about New York. So then comes my hardest decision: wait for takeout or make my own. Usually I've already waited too long and am unable to wait any longer so cooking is my best option. Cooking with a wok is fun and makes the whole meal feel more authentic. But there are some tips that I had to learn the hard way. First, oil is your best friend. Keep it handy. The wok heats up very quickly, and needs to stay lubricated so the food doesn't stick. To make things easier make sure that you have all your ingredients measured out before you start cooking. Mix in a circular motion constantly to keep everything from burning. Ideally, rice should be hot or at least warm when it's added to the wok. If rice is cold add a few tablespoons of water initially to keep it from burning and drying out. And again keep stirring it constantly. Place one tablespoon of oil in the wok along with 3 chilies. Cook for about a minute. And then place ginger and garlic into the oil. Cook chilies, ginger, and garlic for another minute. Next, add your protein of choice. I used mock duck which I found at the farmers market in the Asian section. Since its fake meat it only really needs to be warmed up, so just to get some the flavor from the oil I cooked it for two minutes. If you're using real meat of course you want to cook until it is cooked through. Once meat is cooked and/or warmed up remove from wok. Add another tablespoon of oil into Wok and lightly scramble eggs. 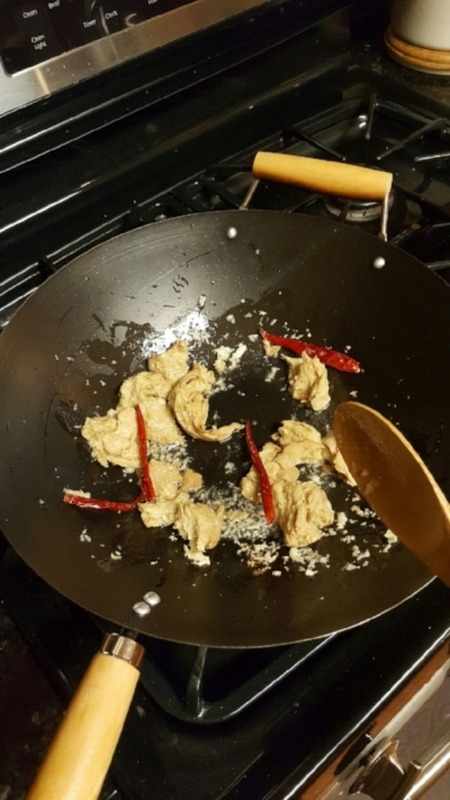 Add protein, chilies, ginger, garlic, and rice with another tablespoon of oil into Wok. Cook everything together for one minute and then add mushroom sauce. Mix everything together with one more tablespoon of oil for 2 minutes. And just like that in-home takeout. You can also add vegetables to fried rice. Make sure vegetables are cooked al dente and add 1/2 tbsp more sauce. You might never order take out again.